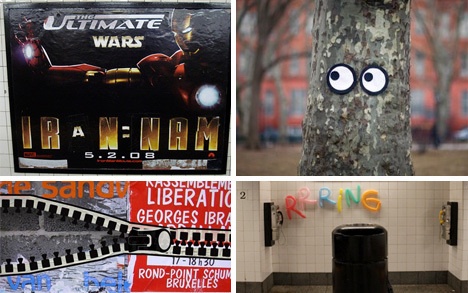 By now, we’re all used to seeing graffiti and public art in urban and suburban settings. We’re so used to it, in fact, that we typically walk right by without giving it a second glance. 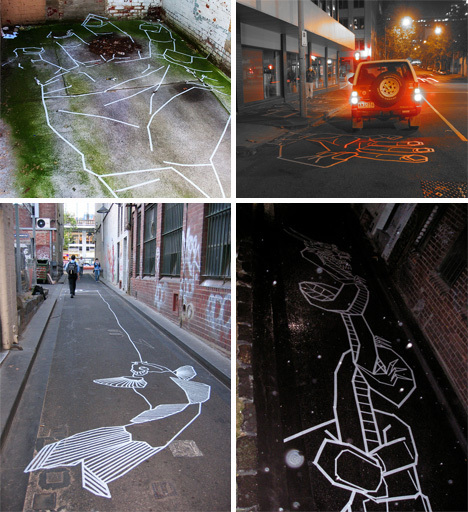 But would you be able to ignore graffiti if it were done in a medium or a method you’d never seen before? These 11 innovative artists are stepping up the standards for graffiti and public art by doing it in ways we don’t usually see, but just might notice. Some of them are pure brilliance and sure to catch the attention of even the most jaded city-dweller. 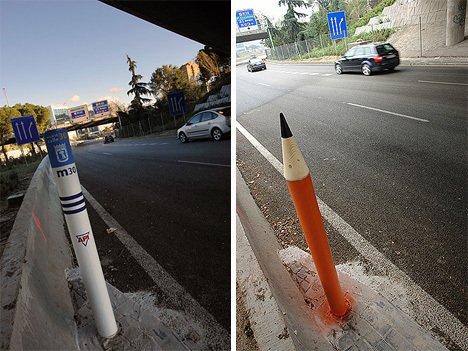 If you saw Buff Diss‘ work on the street, you might be inclined to think it was paint. But the crisp, clean, bold lines give it away: he works in sticky tape. The Australian artist uses masking tape and electrical tape to lay his images down over streets, walls and windows, making it at once 3D and part of the urban landscape. 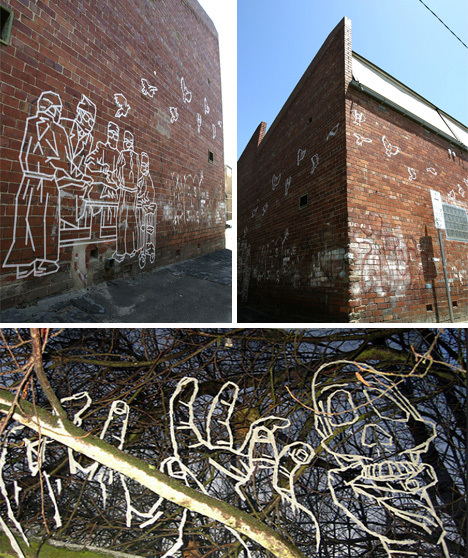 He’s shown his unusual graffiti style in galleries, but his street art is what’s really amazing. It’s definitely got a graffiti flavor to it, but it also has a decidedly playful feel. 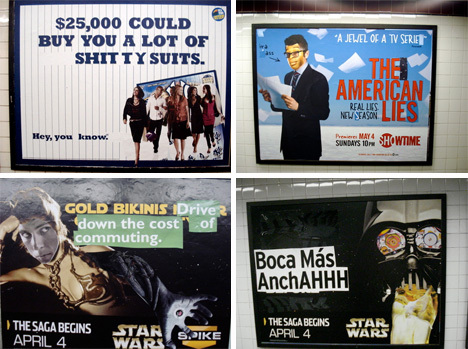 If you’ve taken the subway in New York in the last couple of years, you’ve probably seen some of Poster Boy‘s work. 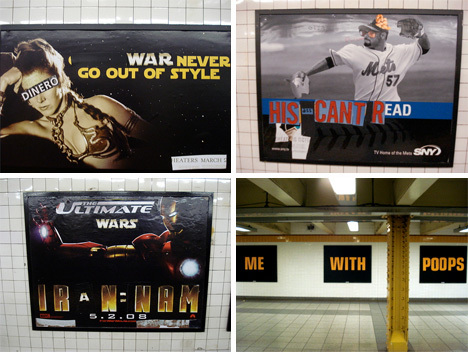 He’s an anti-consumerist guerrilla artist, meaning that he takes the advertisement posters that are so prevalent in subway stations, uses a razor blade to liberate their components, and rearranges them into new messages. 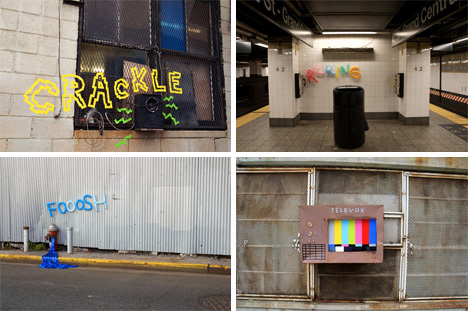 He’s been called New York’s answer to Banksy, though his pieces seem more pointed and anti-consumerist than Banksy’s. He’s said that there will be no capitalizing on his newly-found fame; no books or gallery shows are in the works. It’s rumored that Poster Boy isn’t a single person, but rather a subculture movement fueled by the work of many. 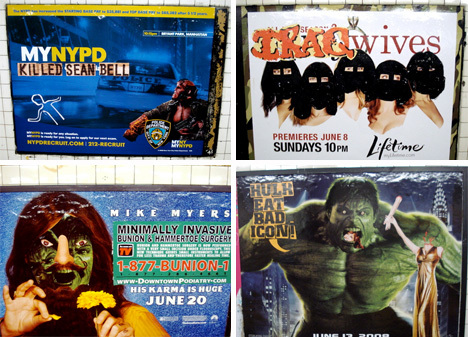 We may never know the truth, but Poster Boy’s work is inspiring the New Yorkers (and Internet denizens) who see it to think twice about ubiquitous advertising. 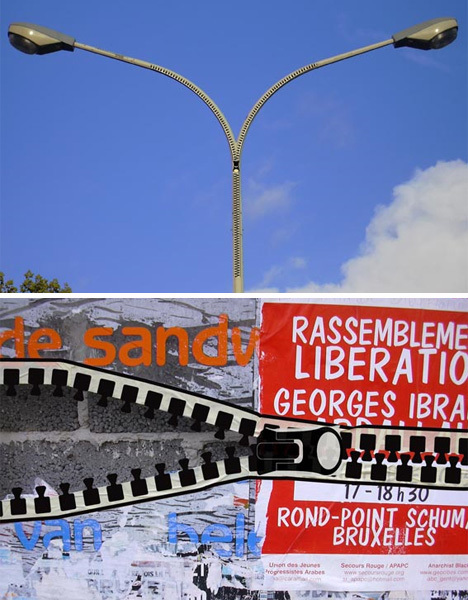 Visit his Flickr stream to truly appreciate the genius behind his subversive poster reorganizations. Drawing in the sand may not seem to have much in common with graffiti. 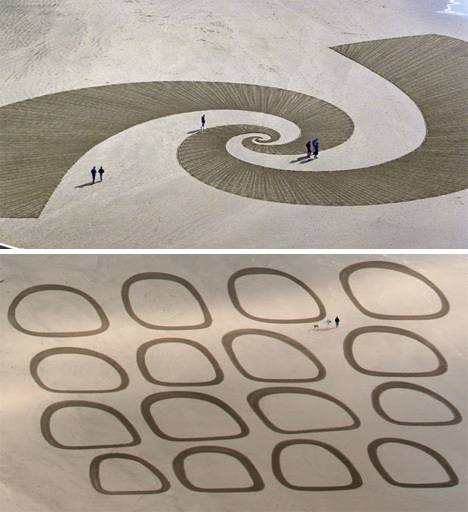 But Jim Denevan‘s intricate and organic sand drawings take hours to complete, require great skill, and are even more impermanent than spray paint on a wall. 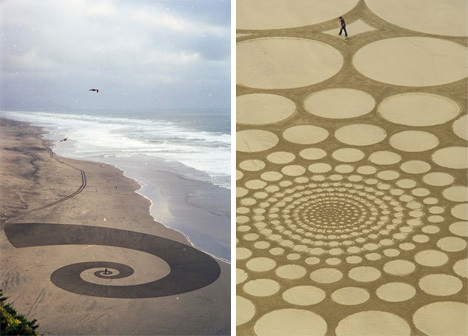 He may not have to hurry or work in darkness for fear of getting caught, but Denevan’s California sand drawings get back to the heart of public art: creating something for everyone to enjoy and asking for nothing in return. He does his drawings free-hand with a large piece of found driftwood, using no measuring devices of any kind, and they are so large-scale that viewing them effectively from the ground isn’t always possible – almost like sand-based crop circles. He’s been known to walk as much as 30 miles in the production of just one piece. With so many street artists taking themselves ever so seriously, it’s good to see one who seems like a prankster at heart. 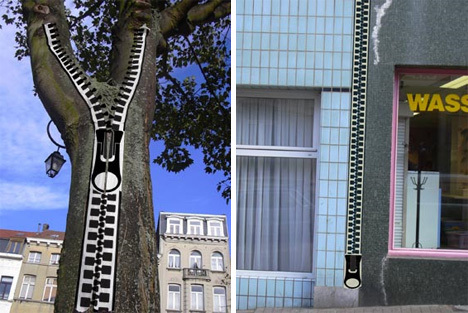 French artist Benoit Lemoine created this zipper tape so that he could add zippers to whatever public spaces were lacking zippers. Imagine what you could do with a big roll of industrial-strength urban zipper. While we’re sure police wouldn’t be thrilled about long strips of tape appearing on every surface imaginable, the tape is presumably removable, making it an impermanent but completely fun form of graffiti. Posterchild does, as the name implies, work with posters and stencils – but those are nothing new. Some of his most distinctive work has been the planter boxes he built and installed in unused flyer boxes, newspaper boxes, and telephone booths. 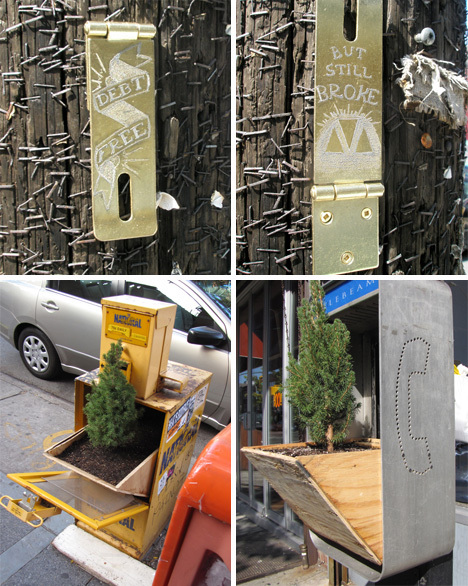 His unique form of guerrilla gardening uses existing unused structures that are otherwise simply wasted space. He plants flowers and trees in them, turning them into something beautiful and unexpected. His most well-known – and most imitated – project, though, is the Super Mario Brothers Blocks he constructed and hung around Windsor, Ontario in 2005. The Canadian artist has a ton of other public art projects on his website that are definitely worth a look. 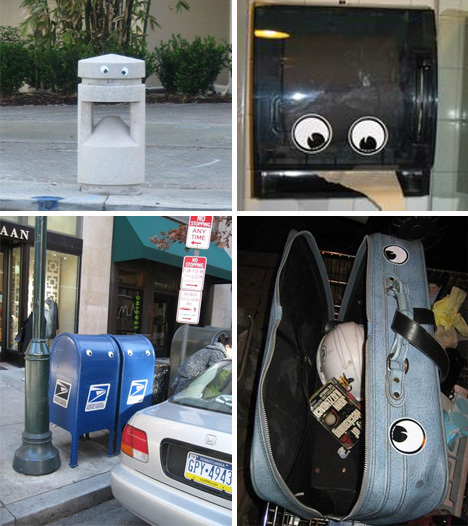 Even the staunchest of public art opponents couldn’t argue that these googly eyes do anything but cause smiles. Engineered by the always-adorable photographer and street artist Color Me Katie, these eyes, with a bit of tape on the back, were put onto random objects to give them instant personality and charm. 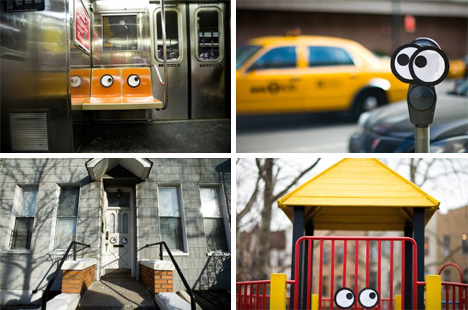 We don’t know if Color Me Katie is involved with the Googly Eye Cru, but they, like her, work in Brooklyn and enjoy slapping adorable eyes onto otherwise-mundane objects. Their extensive photographs prove that they’ve eyeballed just about everything with a flat surface. Sam3 is a Spanish artist whose gigantic silhouette graffiti has been seen all around Europe and in South America. His incredible graffiti has been well-loved for a long time, but his cardboard sculptures are just as amazing. 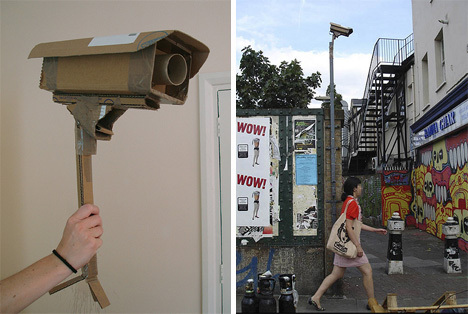 These installations in London, Sao Paulo and Murcia are all made of cardboard and all use public spaces to illustrate the social problems of over-surveillance and homelessness. D. Billy‘s irreverent art reminds us all to be just a little more playful in our daily lives. 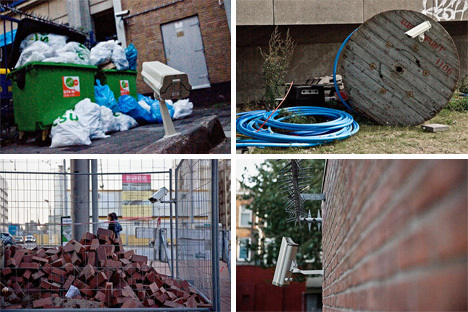 His “site interventions” involve putting colorful tape, cardboard and even balloons into the dull urban landscape. 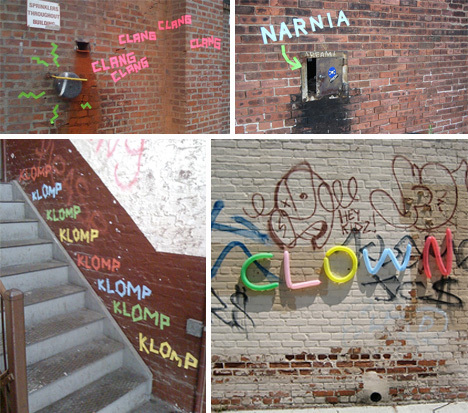 Spelling out onomatopoeia or just making something ugly into something fun, his public art is impermanent but definitely draws second looks and laughter all over Brooklyn. 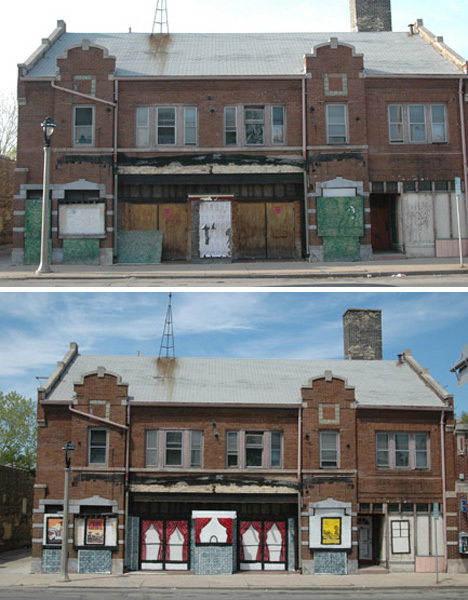 To Milwaukee artist Jeremy Novy, public art is about using public spaces to send a message. He understands that the typical art gallery visitor is educated and wealthy, but the majority of the population may never intentionally seek out art. He creates public works that make his city a better place to live while bringing a bit of the arts to everyone, regardless of income or background. 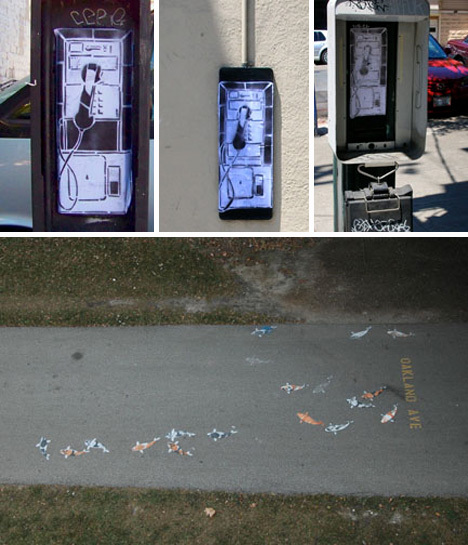 Seeing problems such as abandoned telephone booths and boarded up buildings, he created solutions involving overlaying pictures on the disused objects. The streets of Madrid have seen SpY‘s graffiti and public art around since the 1980s. His work has run the gamut from simple graffiti to the complicated repurposing (and reinstallation) of street signs and public bike racks. 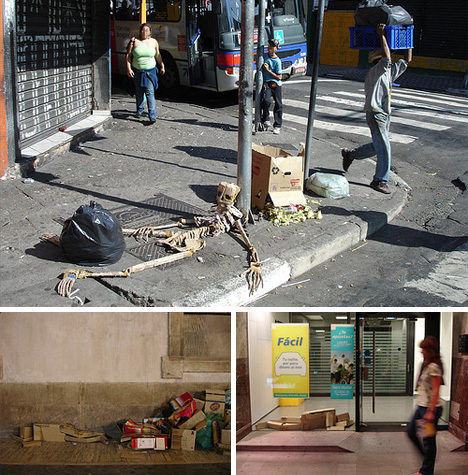 His goal is to break the monotony of urban dwellers and bring a moment of laughter into an otherwise ordinary day.